Clever dust jacket design! Look carefully & you'll notice that the orange striped background is actually a striped shirt. Credit goes to Greg Mollica & Andy Bridge. The protagonist of Yann Martel’s new novel is Henry, a writer whose literary path closely resembles Martel’s own. Like Life of Pi, Henry’s first book is a fable with animals cast as the main characters. It has been extremely successful. Not surprisingly, his next book follows the same formula – another fable with animals. This time about the Holocaust. Beatrice and Virgil begins at a luncheon set up by Henry’s publisher to discuss his new book. The other attendees are extremely critical and, disheartened, Henry stops writing. He moves with his wife to an unnamed city and takes on a series of jobs that have nothing to do with his former life – working at a coffee shop and performing with an amateur theater company. His days are punctuated by a steady stream of letters from fans of his first novel, all of which he answers personally. He seems content, even happy. Until one day Henry receives an envelope containing a short story by Flaubert and a strange letter asking for his help. It leads him to a taxidermy shop in the city where he lives. The shop’s owner, also named Henry, is writing a play about a howler monkey named Virgil and a donkey named Beatrice. Henry-the-Author, along with the reader, spends the rest of the book attempting to decipher the puzzle of the taxidermist and his play. And that’s where things get sticky. Yann Martel is a writer who possesses the rare talent of being able to make characters and settings leap off a page and into the imagination. Beatrice and Virgil contains a particularly well done passage where Virgil describes a pear. It’s good. (In fact, it’s so good that I strongly recommend finding the book and turning immediately to page 44). These kinds of meaty descriptions combined with anthropomorphized animals have become Martel’s stock in trade. As a result Beatrice and Virgil is a compulsively readable book. Getting from start to finish is a relatively simple task and few would argue Martel’s skill as a writer. But once the reader moves past Martel’s obvious talent, she is left facing a seriously disjointed narrative and an incoherent plot. 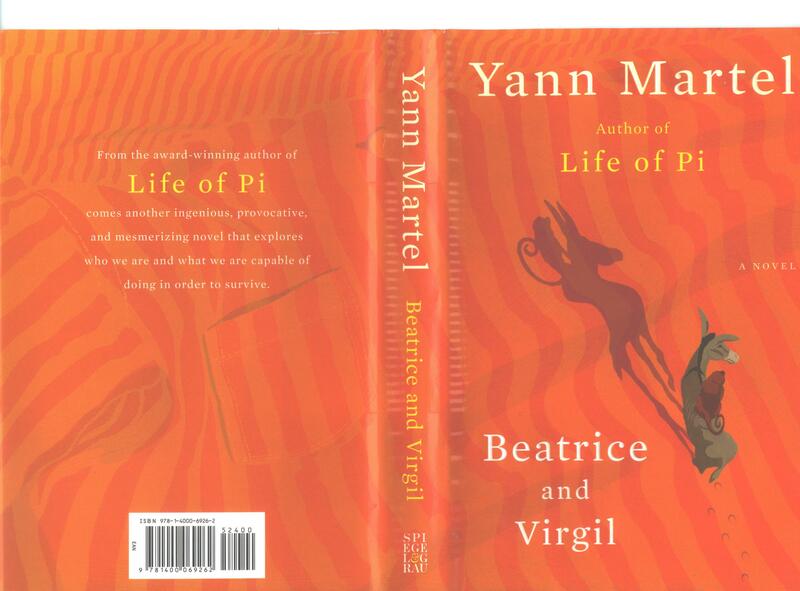 As far as I can tell, Yann Martel has thrown every idea he’s ever had about the Holocaust into Beatrice and Virgil. The book contains (in no particular order): a play styled after Beckett’s Waiting for Godot; a theoretical flip book about the Holocaust – one side of which is a fable, the other a non-fiction essay; a parallel drawn between the genocide of the Jews and the slaughter of animals; a metaphor involving rabid house pets attacking each other; an invented “game” which poses a series of moral dilemmas to the players; scenes of graphic torture; and an episode at a lake that reminded me of the infamous chase across the ice flows in Uncle Tom’s Cabin (admittedly, I’m probably alone in that last connection). Martel has also included the more familiar appurtenances of the Holocaust: a striped shirt, anti-Semitic posters, the Hitler salute (a primate version thereof) and a Nazi sympathizer so two-dimensional he’s a cardboard cutout. And then there’s the Sewing Kit. This seems to be a symbol, and/or a metaphor, which acts as a container for more symbols, and/or more metaphors – most of which are too obscure for Martel to bother explaining to his characters, let alone to the reader. Combine all this stuff with interminable conversations between characters on meanings and intentions, without any true plot momentum taking place… well, I can probably stop there. Martel self-consciously references the problems within Beatrice and Virgil by attributing his book’s flaws to Henry-the-Author’s unpublished work and Henry-the-Taxidermist’s unfinished play. This is what alternately confuses and maddens; if Martel is aware of the issues why not correct them? Take this first quote: Henry-the-Author’s critique on Henry-the-Taxidermist’s play. If Henry hadn’t seen it earlier, he was starting to see now where the problem lay with the taxidermist’s play, why he needed help. There seemed to be essentially no action and no plot in it. Just two characters by a tree talking. It had worked with Beckett and Diderot. Mind you, those two were crafty and they packed a lot of action into the apparent inaction. But inaction wasn’t working for the author of A 20th-Century Shirt. The next section is from the ill-fated dinner where Henry-the-Author’s manuscript is dissected by an assortment of editors, historians and critics. To that third iteration of the question, Henry had no answer. Perhaps he didn’t know what his book was about. Perhaps that was the problem with it. His chest rose as he breathed in heavily and sighed. He stared at the white table cloth. Red-faced and at a loss for words. As I said, Martel is consistent in his critiques – the absence of a unified plot, the lack of action, the endless dialogue. The question is: why? Is Beatrice and Virgil nothing but an exercise in the absurd? Or is Yann Martel simply stating that the genocide of over 5 million people is wrong, and that everything else (the books, symbols, plays, films) is so much clutter obscuring that single, important and inescapable truth? Has he unwittingly created his own version of the clutter? Is the book a misguided writing experiment? 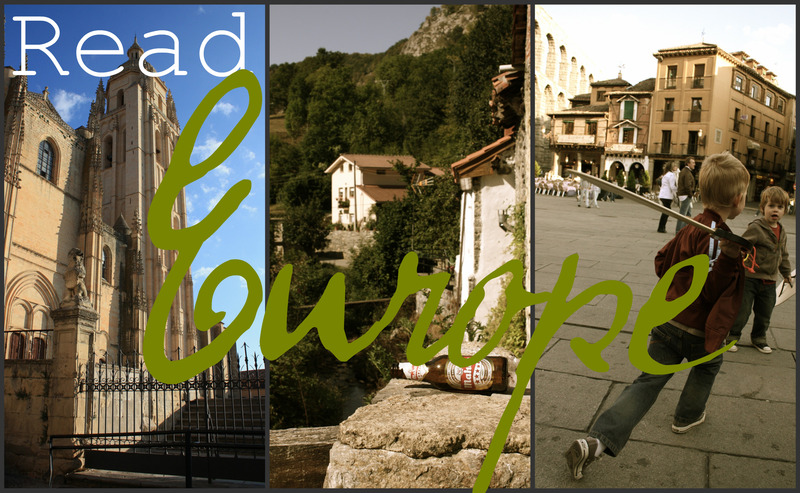 In the end I have absolutely no idea… which is why Beatrice and Virgil fails. When an author’s message is this unclear his reader is left with no choice but to make assumptions about his intentions. And assumptions ultimately are more about the person who is making them than what they are being made about. If after two hundred and thirteen pages all the reader is left with is her own assumptions, what has been accomplished?